The above words are the conclusion of the play ‘Journey’s End’- a powerful reconstruction of life in the trenches based upon the author’s own experiences of fighting in the First World War as an officer in the East Surreys. The play depicts the period of March 1918, when the British sat and waited for the expected German offensive. The German High Command had been able to reinforce their Western Front forces by the transfer of men and armaments from the Eastern Front following the surrender of the Russians at Brest Litovsk in 1917. The Allies were in a weakened state at the beginning of 1918. The Battles of Arras, Messines, Ypres, Passchendaele and Cambrai in 1917 had taken a big toll. The French had been reluctant to do anything other than defend their lines after the failure of the Neuville offensive on the Aisne in June 1917. The huge losses inflicted on the Poilus, resulted in mutinies that forced the BEF to take the responsibility for an enlarged part of the Western Front, but with weakened forces. The Americans had entered the war, but with a small regular army and a very slow mobilisation process, they failed to meet the promised number of troops until the late spring of 1918. In addition, the British Generals in France and the politicians in London did not see eye to eye on the tactics to win the war. Lloyd George and Douglas Haig were not on good terms. The former did not consider that the war could be won on the Western Front; preferring expeditions to Mesopotamia, Salonika and Italy. He also considered that Haig’s tactics in 1917, especially at Passchendaele, had resulted in unacceptably high casualties. Thus, he refused to meet Haig’s requests for reinforcements, even though there were many new conscripts in UK based training camps. This refusal forced Haig to reorganize the structure of the BEF by reducing the Brigade strength from 4 to 3 Battalions. It also resulted in a thinning out of the troops on the front line, especially in the area defended by the British 5th Army under Gough, south of Peronne on the Somme. So it was, that the Germans decided to target the British south of Arras in their March 1918 offensive, code-named St Michael. They had developed a new tactic of a massive creeping barrage, followed by waves of storm troopers attacking across No Man’s Land and pushing deep behind the defensive outposts to reach the British artillery, destroying it before it could be effective. Against this, Haig’s staff had developed new defensive tactics, with a Forward Zone of isolated outposts and behind these the Battle Zone of very strong defensive positions. The Battle Zones included masses of barbed wire and machine guns, and had been quickly built in early 1918 using thousands of infantry-men as labourers. Haig had to best guess where the Germans would attack first. 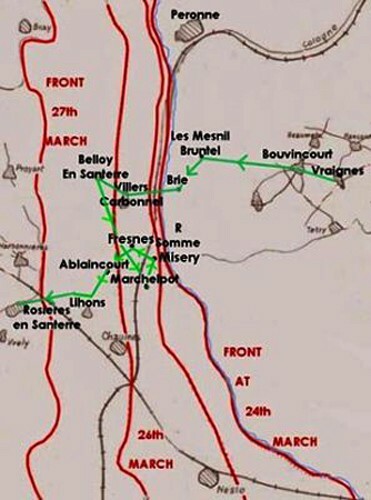 By mid March 1918, intelligence gathering resulted in the conclusion that the attack would be south of Arras against the 3rd and 5th Armies- that part of the BEF front line where infantry reserves were at their weakest. At 04.40 on 21st March 1918, there began the biggest artillery barrage of the war, which in one day was to see 3.5 million shells rain down upon the BEF in a line from just south of Arras to the Somme. The main targets were behind the front line - the BEF artillery positions. These were hit by gas shells to prevent the gunners from retaliating. The BEF Forward outposts were soon over-run by the German’s new storm trooper formations who were taking full advantage of the mist. Soon BEF battalions were in full retreat to prevent capture or annihilation. The 5th Army, under General Hubert Gough, was particularly hard hit. The lack of in depth reserves in the Battle Zone began to tell, where the defences had been hurriedly built after taking over from the French. As Haig had predicted, the lack of these reserves meant that all the troops could do was stand and fight to the last, which is exactly what they did in most of the situations. BEF casualties on 21st March alone were horrendous at 38500 of whom 21000 became POWs. The 5th Army under General Gough desperately tried to defend the bridges over the River Somme. Eventually he resorted to packing every bridge with explosives, ready to blow them up if the Germans crossed. Regrettably, when the time came, it did not always work. So the Germans were able to find several crossing points, pushing the BEF further back. There were many acts of heroism as small units of men fought rearguard actions to allow others to withdraw. Roads became clogged with men and transport columns, presenting easy targets for both the enemy artillery and their planes. By 23rd March the retreat had become something of a flight in some sectors, so much so, that Haig insisted that Gough’s 5th Army should hold the line of the River Somme at all costs. Haig also met with the French commander Petain to ensure that the French and British Armies retained contact, preventing the Germans from infiltrating between them. All BEF reserves were now in the Battle Zone, but the defenders were spread too thinly along the whole retreating front line and time was too short to allow the building of robust defences to hold back the masses of German troops. As the BEF retreated, so supply lines became disrupted, so that in a few isolated positions, the discipline of the British Army cracked, resulting in the looting of supply dumps and civilian farms. The Somme line could not be held by the 5th Army, as the whole of its structure was beginning to disintegrate under the storm. Battalions from different Regiments and Brigades from different Divisions all got mixed up, as the HQ staff officers tried to manipulate their reduced forces as best they could. The Germans too were tiring in their relentless pursuit of an enemy, who took every opportunity to stand and fight and in many instances inflict severe losses on them. Between 21st and 26th March 1918, the BEF had lost 75000 men, - a figure that stunned Lloyd George and forced him to reverse his policy. In early 1918 Lloyd George had refused to provide Haig with additional men to make up the numbers after the casualties of Third Ypres. This refusal had been a major contributory factor in the weakness of the 5th Army. Now belatedly, Battalions were withdrawn from other theatres and sent to the Western Front. The fighting age was reduced from 19 to 18 years of age and battalions on meaningless Home duties were dispatched to France. 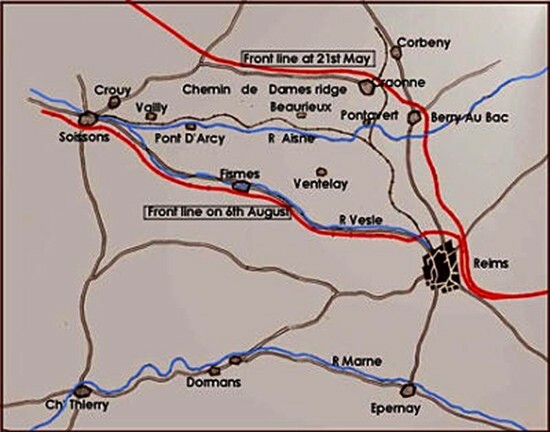 The retreat in the southern sector of the front proceeded until just East of the crucial railway hub of Amiens. By the end of March 1918, the defences were beginning to hold, aided by the French and the fresh Australians. In April 1918, the town of Villers Bretonneux became the point where the German attack lost its impetus. The Germans had been stopped short of their objective and Amiens remained in allied hands. Had the German offensive blown itself out? Had the BEF with its limited resources been able to stop itself from being isolated from the French? March 1918 was the beginning of a series of events that shaped the latter stages of the Great War. Hundreds of thousands of soldiers, including some of my relatives, had their own experiences of the St Michael Offensive. I now want to examine the actions in which they were involved between 21st March and 5th April 1918. When the German offensive began on 21st March 1918, General Byng’s Third Army was opposite Cambrai, with the 40th Division in reserve. Part of this Division was the newly created 40th Battalion Machine Gun Corps, in whose ranks was Sergeant Wilfred W Livermore MM, my grandmother’s cousin. Wilfred Livermore had been serving in France since May 1915 and had won the Military Medal at the Battle of Arras. As the strength of the German offensive became apparent, Byng called up the 40th Division to stop the break through. Sergeant Wilfred Livermore and the rest of ‘D’ company were defending the retreating infantry around the village of St Leger, south of Arras, where they inflicted substantial casualties upon the successive waves of storm troopers. But the tide could not be stemmed, in spite of the heroism of the machine gunners, who remained behind to cover the retreating infantry. By the night of 25th March the 40th MGC was in tatters and orders were received for them to withdraw and for the 42nd Bn. MGC to take over. The War Diary of 40th Bn. MGC WO95/2601 provides a summary of the very fluid situation between 21st and 25th March. 11 30 am B and D companies ordered to take up positions in the 3rd system to support the 120th and 121st Brigades. March 24th Enemy attack continued all along 40th Division front. Orders received for the relief of 40th Division. Battalion to be relieved on 25/26 March. Issued orders to B , C and D companies for relief. March 25th Battalion Headquarters and A company moved to MONCHY AU BOIS. B, C and D companies joined from the line at night. March 26th Battalion paraded to move to BIENVILLERS AU BOIS. Stopped en route and ordered to send guns for defence of ADINFER WOOD. This War Diary WO95/2601 also contains a very detailed report on the period 21st to 26th March 1918, written after the action by Lt. Col. J Roberts. This clearly shows the very rapidly changing nature of the conflict and the ability of the MGC sections to stop the storm troopers in their tracks. Sergeant Livermore was in charge of a gun team in D company, to which this report makes many references. The guns of D company arrived at the ST LEGER—VAUX road at 5 pm on 21 MARCH 1918 and immediately came into action-------about 600 of the enemy advanced west of ECOUST and coming into action from their limbers annihilated them. At about 10 am on 22 MARCH 1918 the enemy drove strong attacks. D company brought heavy fire to bear on them inflicting very heavy casualties and on one occasion annihilating about 1000 of the enemy in massed formation. 22/23 MARCH 1918 north of Mory the enemy launched a heavy attack in the afternoon and forced our infantry back. 3 sections of machine guns caught him as he advanced over the ridge doing great execution and covering the withdrawal of the infantry. At 10 am the enemy again attacked and forced our infantry to withdraw. The machine guns were able to cover the withdrawal and inflict heavy casualties on the Germans. On 25 MARCH about mid day the enemy attacks on ERVILLERS were resumed. No 2 section was enabled to deal with large masses of the enemy and to inflict heavy casualties on them . The section only withdrew when it was practically surrounded on the high ground west of Ervillers. On the night of 25/26 MARCH 1918 orders were issued for the guns of 40th Bn. Machine Gun Corps to withdraw as the 42nd Bn Machine Gun Corps had taken over the machine gun defence of the line. 2/Lt. Baker D company volunteered to remain and organized the front line of the infantry. 2/Lt. Whittaker with his 4 guns remained in position after the infantry had withdrawn and held off the enemy firing at 800 yards into dense masses. 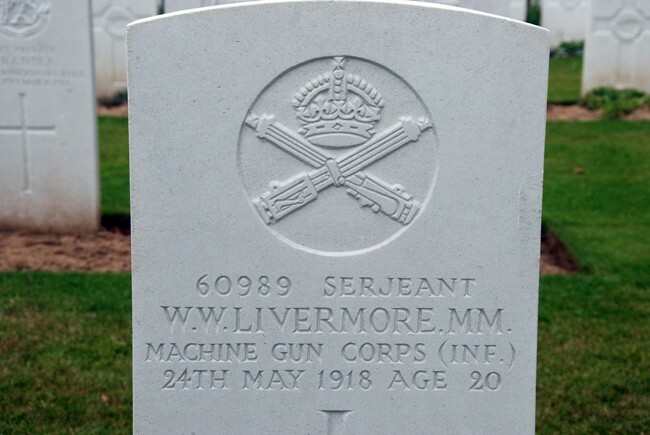 Wilfred Livermore is now buried in the CWGC British Cemetery, just outside the village of Favreuil north of Bapaume and some distance south of the area of the fighting recounted in the War Diary. His headstone has the date of his death as 24th May 1918, two months after the action. The probable explanation for this was that he was wounded and taken prisoner and died in captivity from his wounds. This has been confirmed by the ICRC (Red Cross Geneva) who hold the records of Prisoners of War in WW1 which they are currently in the process of digitalizing, ready for 2014. 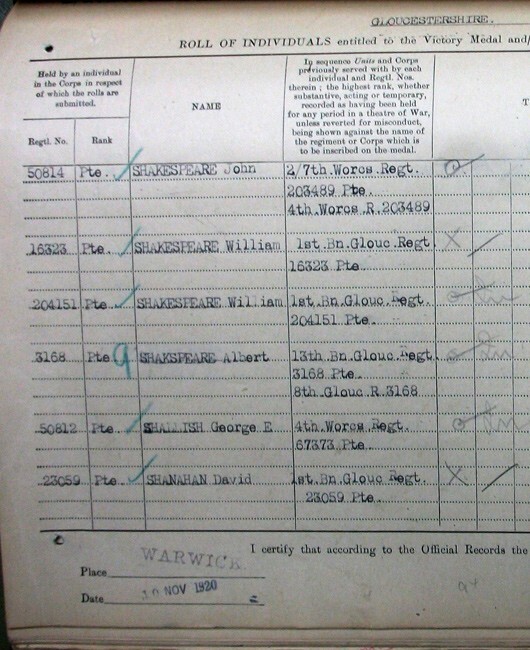 The ICRC attestation document shows that Sergeant Livermore was captured at Gommecourt N W of Albert and a short distance from Adinfer Wood mentioned in the War Diary. He was detained in a German army Field Hospital in the village of Beugny, north of Bapaume and near to his current resting place. The document (Figure 3) also says that, on his death, he was buried in plot 194 of the German cemetery in Beugny. At some point, after the end of the war, his body was transferred to the Favreuil British Cemetery along with 7 other British soldiers who had been buried in the Beugny No 3 German Cemetery. 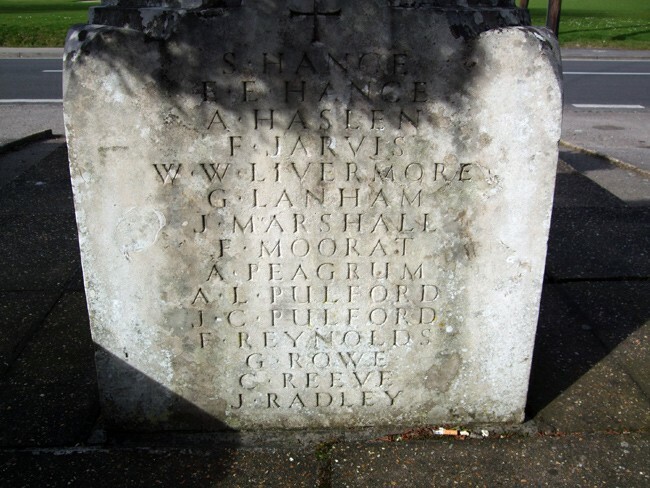 Sergeant W W Livermore M M is commemorated on his home village war memorial in Felsted, Essex and in the Machine Gun Corps Roll of Honour in St Wulfram’s Church, Grantham. At the time of the St Michael offensive in March 1918 the 12th Battalion was in training behind the lines and was called into the front around St Leger south of Arras. By the 22nd March the Battalion found itself virtually surrounded by waves of storm troopers and lost its commander Lt. Col. Eardley-Wilmot shot by a sniper through the mist. 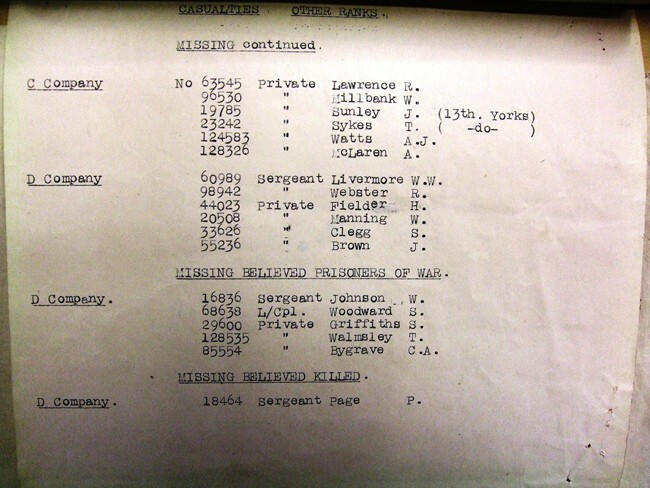 A message from HQ telling the battalion to withdraw did not reach them, such that three companies of men were almost all killed or taken prisoner. 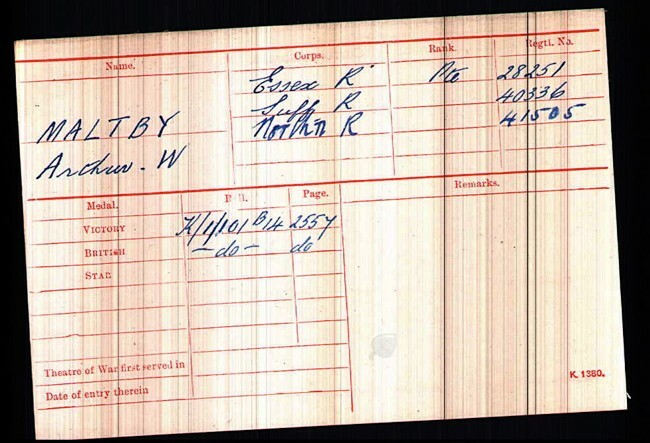 It was a miracle that any survivors were able to withdraw under cover of darkness and on 26th March 1918 the battered Battalion of the 12th Suffolks, including Pte Arthur W Maltby, was withdrawn. The Battalion War Diary WO95/2616 provides a graphic account of the suffering during their brief involvement in the St Michael Offensive. 22nd 6 am The Commanding Officer Lt. Col. T Eardley-Wilmot DSO took a platoon out of the front line to form a forward platoon & cover a gap on our left. There was a very heavy ground mist and the enemy snipers had taken up good positions and sniped the C O and the artillery liaison officer killing them both. 4pm We opened LG and rifle fire upon the enemy and got good results. 6 30 pm Later we saw the enemy advancing and driving our troops back. Our forward coys were ordered to fall back to the Army line. The message was delivered too late as no one from the 3 coys returned. 11pm to 1am the enemy attacked but we held the line on our front. 23rd 1am All touch had again been lost with other units and as the enemy fire died down the troops were marched in column of route under cover of darkness across country towards ERVILLERS. Night 23rd—24th comparatively quiet but enemy shelled our positions and sprayed us with MGs all day. At 8 pm this line was evacuated and the remnants of the Bn. Marched to AYETTE where they spent the remainder of the night. March 26th 8 am Battalion marched to BIENVILLERS and took up an outpost position. Exhausted, depleted and traumatized, the survivors of 40th Division were moved north to a quiet sector around Armentieres, a town made famous by the song ‘Mademoiselle from Armentieres parlez-vous’. Further South from the 40th Division actions, the 50th Division had been in training at Boves near to Amiens and was quickly ordered East of Amiens to meet the German attack on 21st March 1918. Part of the 150th Brigade of 50th (Northumbrian) Division was the 5th Battalion Yorkshire regiment in whose ranks was Private Samuel R D Maltby, another of my grandfather’s cousins from Cambridge. Samuel Maltby had been wounded in April 1917 during the Battle of Arras and had returned to his old unit in January 1918. The 5th Battalion War Diary WO95/2836 provides a detailed account of their rearguard action fought between 21st and 31st March 1918, in which they withdrew nine miles to the S.E. of Amiens. 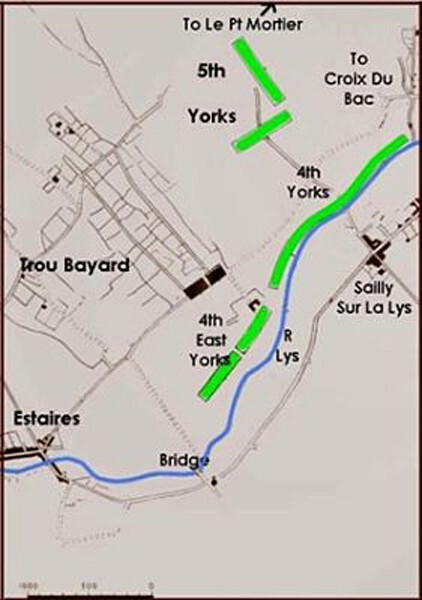 The 4th and 5th Battalions of the Yorkshires fought together in this action, which was so chaotic and fast moving that in the end Battalion identities were lost, as groups of stragglers were formed into the 150th Brigade Composite Battalion. 23rd March . 8 am received orders to withdraw along main MONS-BRIE road, 4th Yorks to cover withdrawal to Mons. Then engaged with the enemy and withdrawal difficult as enemy was coming round right flank. From MONS to BRIE fought rearguard action. Withdrew and crossed R Somme at Brie about 3pm. On 23 March 50th Division was relieved by 8th Division, but on 24th the Germans crossed the river Somme and 150th Brigade was ordered to rush across country to bolster the defences of the river at Licourt. 25th March . At about 9 am the enemy attacked and the WORCESTERS gave way and enemy occupied LICOURT by 10 am. The 2 Coys. of the Bn. in front line held on till the end and only a handful of men got away. Lieut HEPTON and many of his men were wounded and captured. At 10 30 am the enemy completely occupied LICOURT and enfilade fire caused the Bn and 4th E Yorks to withdraw and take up position on high ground. The Bn and 4th E Yorks held on here from 9am to 5 pm. During the night Gen Haig sent for Col Thomson 5th Yorks and thanked him and told him he might be required to fight rearguard action if withdrawal ordered. 26th March . At about 8 am enemy appeared and firing ensued. Withdrawal by WORCESTERS took place . This incident made withdrawal of 150th Composite Battalion very difficult and whole of rearguard platoon of 5th Yorks was either killed or captured. 27th March. Casualties caused by our own artillery, one gun firing short. Col Wilkinson was here wounded and Col. Thomson assumed command of 150th I B , unit. The enemy launched an attack at about 7 pm, but was driven back with fairly heavy casualties. 28th March. Other units were constantly retiring through the Bde unit. Gen. Haig said position had so altered that he was at a loss to decide on course to be pursued, but that Col. Thomson had better take up a position on high ground S of CAIX and cover withdrawal of troops in front. 30th March. The composite Battalion would take up a position and fight a rearguard action to cover the safe withdrawal by troops across the R. de LUCE. Owing to his being hit Col. Thomson withdrew to Bde H Q at HOURGES and handed over command to Capt. Pollock 4th E. Yorks. At 7pm the 150th I.B. unit in conjunction with the French on right counter attacked re took the copse and some 70 prisoners. 31st March. At about 12 noon enemy put down heavy barrage on line and on DOMART and HOURGES and at about 2 pm attacked on a frontage extending beyond both flanks of 150th frontage. The French having given in on the right, the enemy outflanked and arrived in the rear of 150th party. Capt. Pollock and party fought till the last moment and inflicted heavy casualties on the enemy. The 5th Battalion Yorkshires had experienced 372 casualties by the 31st March, including its C.O. Colonel Thomson, who was wounded, but remained at his duty. 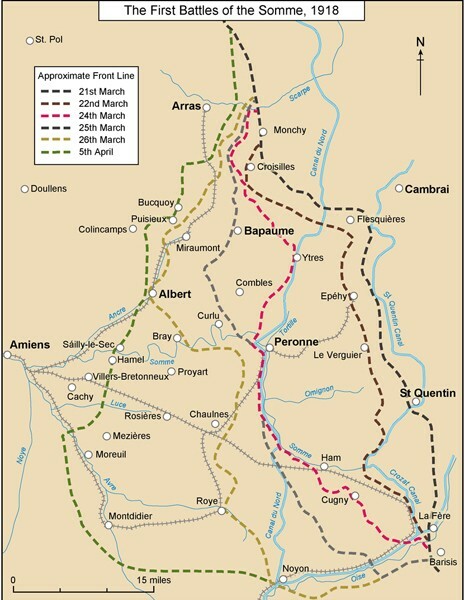 On 1st April what remained of the Composite Battalion marched off to the suburbs of Amiens. It was totally exhausted by ten days of constant fighting with no sleep or proper food and numbered only 849 men of which 234 were 5th Battalion men including Samuel Maltby. The 50th Divisional History pays this tribute to its men. To the undying glory of the British soldier, let it be remembered of him that in the greatest battle the world has ever known , he carried himself with great honour and courage fighting the harder as the situation grew more desperate, often preferring death to surrender. In addition the History also bemoans the fact that whilst other units fighting rearguard actions received praise in the official dispatches, the 50th Division appeared to go unrecognized. The results of the Great German offensive on the Somme in March 1918 were terribly disappointing to the enemy. That he did not break through was due to the splendid courage and tenacity of the British soldier. The fine fighting displayed by ALL units of the 50th Division received but little notice in official dispatches. 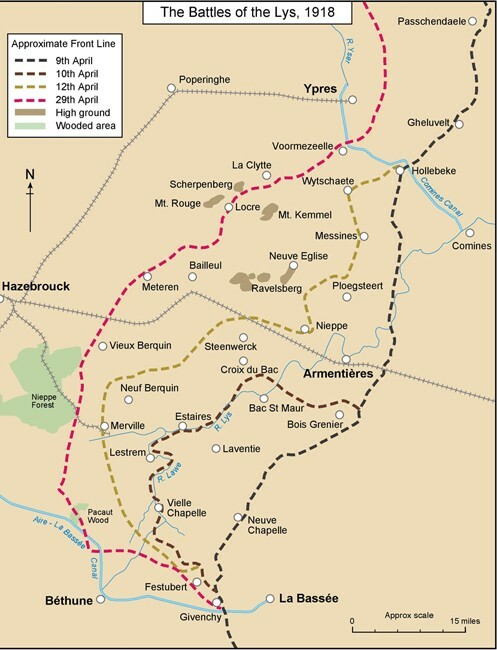 As the St Michael offensive commenced, the 11th Bn was hastily moved south from the Ypres sector to an area around Moyenneville and Ayette, south of Arras. The Battalion War Diary WO95/2403 suggests that unlike other units the 11th Borders took a minor role in stemming the tide of the German advance. Whilst other Battalions were fighting for their lives, the 11th Borders remained in old German trenches, enduring the occasional bombardment. This was effectively the end of the 11th Battalion’s war because in May, it was amalgamated with 5th Battalion, with whom Frank Jarvis fought until, in October 1918, he was killed in action. On 9th April 1918 at 04.15, the German barrage commenced, followed at 08.45 am by the storm troopers attacking across No Man’s Land under cover of yet another mist. It was a repeat performance of St Michael. The outposts were soon overcome and the BEF was engaged in trying to stop the Germans from crossing the river Lys. Again, Haig had to manipulate his weakened forces and, although Lloyd George had released more UK based reserves, the proportion of this enlarged army devoted to infantrymen was only 36% compared with 59 % in 1917. The ‘poor bloody infantry’ the so called Joe Soap’s army had to bear the brunt of this new attack. Supreme command of the Allied Forces had been given to the French General Foch in April 1918 and it was to him that Haig requested that the French take over a larger sector of the Front Line. Foch refused this request, preferring to keep back his reserves, fearing another German attack in another sector. Haig and the BEF were again alone. The German attack now extended to Armentieres, a town that had always been in allied hands and also to the Messines ridge which had only been taken in June 1917. There were elements of a retreat, though not on the scale of March 1918. On 11th April 1918, Haig felt the need to issue his now famous ‘backs to the wall’ special order of the day to instill into his men the need to hold fast at all costs. The defences held for as long as they could, before falling back to the next town or village; all the time getting closer to Hazebrouk. Again the BEF just managed to halt the progress of the Germans and with fresh divisions from Italy, Palestine and Egypt and some French divisions, the crucial rail terminal at Hazebrouk was secured. However, further north, the British had lost the Messines ridge and eventually had to withdraw from the Passchendaele ridge too. By the end of April, although large areas of land had been gained, the Germans had failed to take Hazebrouk and the Channel ports. Time was running out for Ludendorff as more and more Americans began to arrive in France and more troops were released from training camps in the UK. How did my relatives fare during the Georgette offensive - the Battle of the River Lys? The 40th Division had suffered substantial losses during the St Michael offensive and was moved north to a quiet sector around Armentieres. Private Arthur Maltby, my grandfather’s cousin and the others in the 12th Suffolks, must have thought that they had survived everything that the Germans could throw at them. However, they were wrong - for this quiet sector of the front was shattered by another German attack. On 9th April at 04.15, the enemy attacked along the River Lys. The 12th Suffolks were called from reserve to defend around Fleurbaix, where they put up a stout resistance, inflicting substantial casualties upon the thick waves of attacking storm troopers until 16.30, when they fought a rearguard withdrawal. On 10th April they withdrew across the river Lys to Nieppe, where they dug in, before withdrawing further west to be in front of the railway terminal of Hazebrouk. The Battalion War Diary WO95/2616 provides a detailed account of their involvement from 9th to 13th April 1918. 4.15 am A very heavy bombardment by the enemy was put down on front line and FLEURBAIX defences a tremendous amount of gas being used. 11 am The whole line under machine gun fire from enemy. 4 30 pm Our casualties very heavy particularly “ B “ and “ C “ coys. 6 am Heavy shelling and MG fire on our front and left followed by enemy attack. Our troops generally driven back to ERQUINGHEM. 2 am Orders received to make our way to NIEPPE and hold the railway. 2 pm Battalion ordered to counter attack and restore position. The attacking lines moved off and took buildings killing number of the enemy. The enemy retired in a northerly direction but left several MGs and a large number of snipers in the buildings. At 6 pm orders were received not to press the attack but to hold on to our positions until 8 30 pm. Our casualties were heavy about 70 in this attack but we inflicted heavy casualties on the enemy. 8 30 pm Moved back in order. 9 pm Marched to LA CRECHE arriving at 11 pm and at 4 30 am marched to STRAZELLE where we dug in . 4 30 pm Marched and joined our transport and at 9 15 pm marched to BAVINGHOVE arriving at 11 30 pm and bivouacked for the night. 9 15 am Marched to ST. OMER to billets. So ended the 12th Battalion Suffolks involvement in the Great War, having lost 423 men from their ranks. In May, it was reduced to cadre, with officers and men being sent to base depot for re drafting including Arthur Maltby, who found himself posted to 2nd Battalion Northamptonshire Regiment in June 1918. The 50th (Nothumbrian) Division, which included the 5th Yorkshires and my grandfather’s cousin Samuel R D Maltby, having suffered during the St Michael offensive, had been moved to a quiet sector to the north of Bethune. The sector in which they found themselves was held by Portuguese troops, who fled, leaving a huge gap in the defensive lines when the Germans attacked on 9th April. The 50th Division was tasked with plugging the gap and preventing the enemy from crossing the river Lys at ESTAIRES. This time the troops of 50th Division were mentioned in the official dispatches. During this period 9th to 16th April the 5th Battalion had suffered 11 deaths, 126 wounded and 159 missing. During both German attacks it had suffered 698 casualties, so that during May it received a mass of new recruits to bring it up to strength. Samuel R.D. 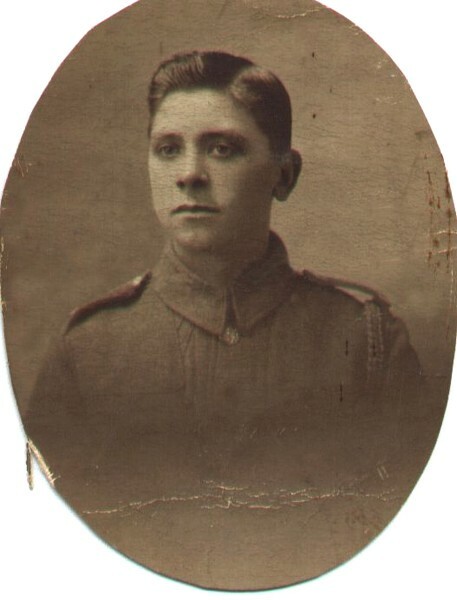 Maltby, aged 24, was now a veteran, having been in the battalion since August 1916. Given what he had experienced, he must have thought that his life had been protected. If he thought that the worst was over, how wrong he was. On 11th April 1918, as part of the 19th Brigade 33rd Division, they found themselves in Brigade reserve around the town of Meteren, east of Hazebrouk, with orders to move at short notice and in fighting order,with each man having been issued with 220 rounds. By April 12th they were dug into positions south of the village of Meteren, ready to defend it against the waves of attacking storm troopers. Their war diary WO95/ 2422 provides a detailed description, with a map of their action during 12th and 14th April 1918. The following is a synopsis of the main actions during this period as reported by Lt Col. Welch C.O. 1st Bn The Queen’s Regiment. April 13th. During the morning of the 13th orders were received to withdrew to the Mont de Lille during the night. There was to be one more roll of the dice for Ludendorff. One more attempt at the big break through. For the Allies, it was a guessing game as to where the next German attack might be directed. Some of the BEF Divisions had been severely battered by the March and April offensives. In a particularly bad state were the 8th, 21st 25th and 50th Divisions. Haig and Foch agreed to swap these divisions with some French divisions from a very quiet area of the front in the Chemin Des Dames, the scene of the French disaster in June 1917. Therefore, in May 1918, these BEF Divisions came under French command on the Plateau de Californie, with the river Aisne at their backs. They were not to know that Ludendorff’s next plan was to attack this very sector, so as to draw in reserves from the north before launching a main attack against the weakened Flanders area. At 01.00 am on 27th May 1918, the German bombardment began with such an intensity that the British infantry could not even get out of their deep dug outs. The pattern of the German offensive was being repeated again. At 03.40 the storm troopers attacked, creating total confusion amongst both the BEF and French defenders on the Plateau de Californie ridge. Many units were surrounded and captured before they could even fire a shot. Those that did survive this onslaught, fell back to defend the bridges over the river Aisne. It was indeed the same story as in March and April, with the BEF fighting rearguard actions to defend river bridges. But it was impossible to hold the Aisne line, so the retreat continued with some units being sacrificed to allow others to escape. Those BEF divisions, that had been transferred to that ‘quiet sector’ on the Aisne, had been pulverized beyond recognition and in the case of the 50th Division, beyond repair - so much so, that some of its battalions ceased to exist for the remainder of the war. My relative Samuel R. D. Maltby, was in the 5th Battalion the Yorkshire Regiment, part of the 150th Infantry Brigade of the 50th Division. His experiences in May 1918 testify to the severity of the situation and provide an example of how, for many, the war ended with imprisonment as a POW. 27.5.18. Enemy attacked at 4 30 am. Barrage commenced 1am. Indeed the narrative of operations by the 150th Infantry Brigade was attached to the war diary and makes harrowing reading. The following is a summary of the main points of the Battle for the Plateau de Californie. A warning being received from Division about 4 pm of an impending hostile attack reported by prisoners to be due to open with a 2 or 3 hour bombardment at 1 am 27th. 27th May . At 1 am the bombardment opened with all nature of shell including gas. All communications were cut within a very short time. The bombardment was the heaviest yet experienced and heavy casualties were caused in the forward posts on the plateau. An infantry attack developed against the Brigade front from the North. The plateau was enveloped on both flanks by about 6 30 am. The hostile barrage was maintained on the Plateau itself to the last it is feared that many men were captured in the deep dug-outs before they were able to come out. Lt Col Thomson (C. O. 5th Bn Yorkshires) reported about 5 45 am that his Head Quarters Company were then fighting around his command post and that they appeared to be surrounded. The Brigade HQ had now become dispersed as a result of hostile shelling. The Brigade Major was wounded whilst withdrawing towards the AISNE. Brigadier General REES, it is believed, became too exhausted to continue and was captured. These few words hardly encompass the devastation that happened to the British Divisions, who had been sent to this previously quiet patch after the March and April mauling. Brig. General Rees reported that Col. Thomson rang up to say that the counter attack he had launched had been swept away and that he was desperately fighting around his headquarters. The terrible disaster which befell the infantry of 50th Division on 27th May saw the end of all those gallant battalions which, whenever possible, had put up a stout resistance. But the majority were surrounded and forced to surrender before they could come into action. On 27th May, in one day alone, the 50th Division had 227 officers and 4879 ranks killed, wounded or captured. The losses on the Aisne were so great for the battalions of the 50th Division that they could not be replaced. Thus, their old battalion identities disappeared. My grandfather’s cousin, Samuel R. D. Maltby 242471 5th Battalion Yorkshire regiment, was one of the thousands who swelled the ranks of the POWs. We can only imagine their mixed feelings of relief at being alive, tinged with a disappointment at having failed to hold back the enemy. For relatives back home, these were anxious times - worrying about their loved ones. In 1918, there were 17500 other ranks imprisoned, almost 50% of whom had been captured between March 21st and November 11th 1918. 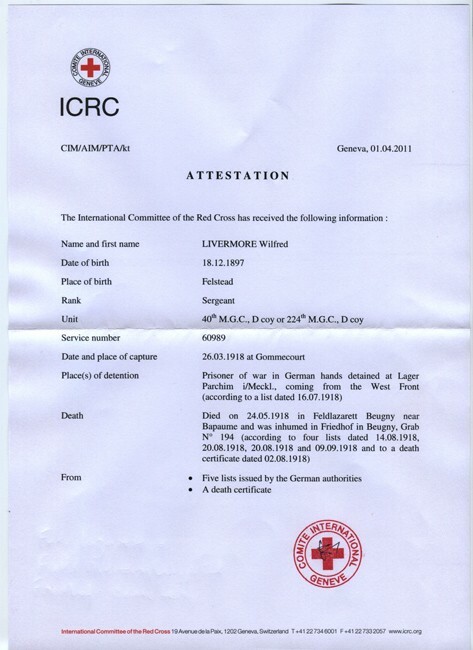 Much reliance was placed upon the ICRC (Red Cross) in Geneva to provide relatives with information about these POWs. 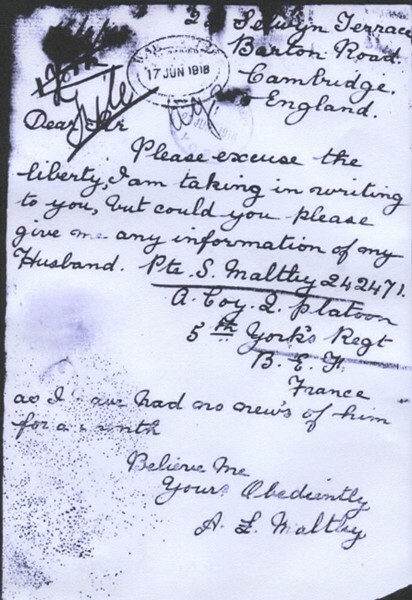 A letter from Samuel Maltby’s wife to his Regiment illustrates that such information could be some time in the coming. So ends the story of my six relatives, who like thousands of other infantry soldiers, endured 4 months of the ‘Storm of Steel’ as the German Army made its final attempt for victory. Wilfred Livermore died in captivity, after valiantly attempting to hold back the enemy in March 1918. Samuel R.D. Maltby joined the massed ranks of POWs in German prisons and was lucky to survive the deprivation before repatriation in early 1919. Four survived to fight on in the Advance to Victory – Frank Jarvis was killed at the Battle of St Quentin in October 1918, George Shallish, Arthur Maltby and my grandfather, George Maltby survived to return to civvy street and family life. For those who survived there is little evidence of what they did. 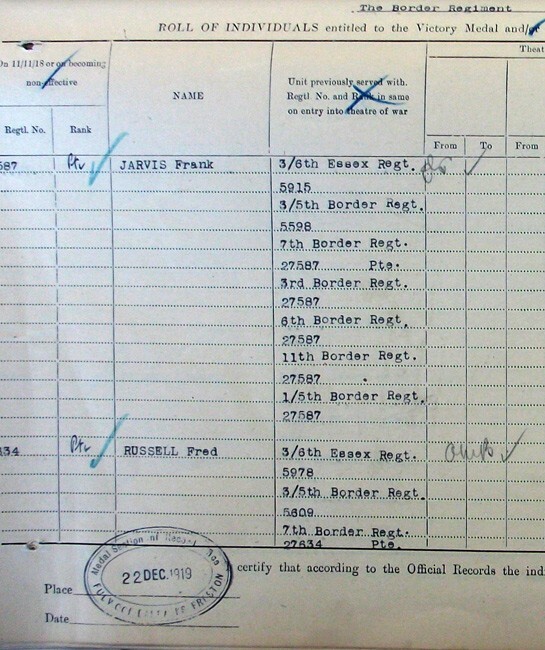 Even the paper army service records for 75% of them no longer exist, due to the German Blitz of May 1940. Only their relatives can try to piece together their stories, using information more readily available thanks to the internet. This is the story of six of my relatives, with information gathered through personal researches. Hopefully, it does them justice and helps in our understanding of what they had to endure, even if most of them found it difficult to talk about their experiences for the rest of their lives. Ancestry. com data base census papers / army service records. Wylly H C The Border Regiment in the Great War Gale & Polden. Graham Sacker Suicide Club Promenade Publications.